Cloth book covers from Gotcha Covered. Our cloth book covers are handcrafted and fashionable. 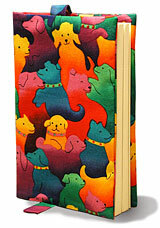 Keep it covered... cloth book covers from Gotcha Covered make reading fun! cloth book covers from Gotcha Covered! Do you like to keep your favorite books in pristine condition and make a true fashion statement while indulging in your reading obsession? You can have both with Gotcha Covered cloth book covers! One happy customer recently wrote... "I just received the book cover.... it is more BEAUTIFUL than I imagined!!! Not to mention the FABULOUS packaging! WOW! You are the BEST! I will DEFINITELY pass the word about your exquisitely made product!" Another writes... "I received my order and I am extremely impressed! I absolutely love these book covers. They are very well made and your packaging and accompanying correspondence is very professional. I will most definitely order from you in the future. These are amazing!" And while showing your literary wiles, you're carrying around a work of art. Each cloth book cover is individually handmade using washable cotton fabric. They're lined for extra protection and durability. The stitched sleeves are easy to slip onto both hard or soft-cover books, and not only protect book covers, but those delicate book corners as well. Reading a great book but need to take a break? Never fear... there's a built-in bookmark! 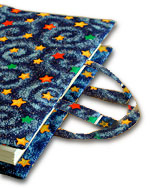 As an option, you can choose fabric handles to be added to your Gotcha Covered cloth book cover. There is an additional fee for handles. 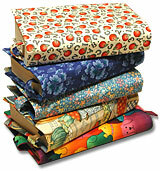 Gotcha Covered cloth book covers are NOT suitable for school textbooks or binders. Keep a bunch of 'em! You'll want a different one for every book! Fabrics range from whimsical to sophisticated. Choose a fabric that best suits your personality... or your mood. Here are the current selections available in all sizes. Click a pattern sample to see a larger view. These one-of-a-kind, pre-made individual items are available for immediate sale! Gotcha Covered cloth book covers are made of high quality cotton, and do NOT stretch. (Note: Not suitable for school textbooks or binders.) They come in seven different sizes. Please contact me with questions regarding custom sizing. With the book closed, measure the cover from side to side and multiply by 2, plus add the width of the spine to obtain the book cover width. Measure the cover from top to bottom to obtain the height. *There is a $5.00 Shipping & Handling charge per 3-item order. Additional fees will apply for International shipments and orders of more than 3 covers. Step 1 Fill in the Order Form below. Click Submit. Step 2 Within 48 hours, you'll receive an email order confirmation and payment request from PayPal. (PayPal is used for credit card payments. You can also pay by sending a personal check or money order - email for instructions. PayPal in the only payment method we accept for international orders.) This confirmation will include a total cost, expected production time, and a link to take you to PayPal's payment page. Step 3 Follow the Paypal link in the email and process your payment. Production begins once payment confirmation is received from PayPal. It's as easy as that! Step 4 Watch your mail box for the arrival of your Gotcha Covered cloth book cover! NOTE: Gotcha Covered cloth book covers are made when they are ordered. Due to their custom-made nature, all cloth book cover sales are final. Fill in this form completely. You'll receive confirmation and further instructions within 48 hours. Fabric handles are an additional $4.00 per book cover. There is a $5.00 Shipping & Handling charge per 3-item order. Additional fees will apply for International shipments. Maximum order request is 3 covers. 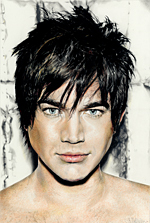 Yes, it's a pencil drawing! Custom pencil portraits of your family, friends or pets from your photos. Order yours now!